"Percy Julian (April 11, 1899–April 19, 1975) synthesized physostigmine for treatment of glaucoma and synthesized cortisone for the treatment of rheumatoid arthritis. Julian is also noted for inventing a fire-extinguishing foam for gasoline and oil fires. Julian also synthesized the female and male hormones, progesterone and testosterone, by extracting sterols from soybean oil and received dozens of honors over the course of his career, and after his death, related to his scientific work. Published Works: "Studies in the Indole Series V. The Complete Synthesis of Physostigmine (Eserine)," Journal of the American Chemical Society (1935). Julian also published dozens of articles in scientific journals. Notable Quote: "I don't think that you can possibly embrace the kind of joy which one who has worked with plants and plant structures such as I have over a period of nearly 40 years, how wonderful the plant laboratory seems." Julian was born in Montgomery, Alabama, on April 11, 1899. One of six children born to Elizabeth Lena Adams and James Sumner, and the grandson of former slaves, Julian had little schooling during his early years. At that time, Montgomery provided limited public education for Blacks. Julian entered DePauw University as a "sub-freshman" and graduated in 1920 as class valedictorian. Julian then taught chemistry at Fisk University, and in 1923, earned a master's degree from Harvard University. In 1931, Julian received his Ph.D. from the University of Vienna. On Dec. 24, 1935, Julian married Anna Roselle, who would go on to earn her own Ph.D. in sociology in 1937 from University of Pennsylvania. They remained married until Julian's death in the mid-1970s. Julian returned to DePauw University, where his reputation for inventing was established in 1935 when he synthesized physostigmine from the Calabar bean. In a series of articles published in the Journal of the American Chemical Society over the course of three years, Julian and his assistant, Josef Pikl, explained how they made physostigmine synthetically. This was a key step in the development of the anti-glaucoma drug physostigmine that is used to this day. Julian went on to become director of research at the Glidden Company, a paint and varnish manufacturer. He developed a process for isolating and preparing soybean protein, which could be used to coat and size paper, to create cold water paints, and to size textiles. During World War II, Julian used a soy protein to produce Aerofoam, which suffocates gasoline and oil fires. Julian was noted most for his synthesis of cortisone from soybeans, used in treating rheumatoid arthritis and other inflammatory conditions. His synthesis reduced the price of cortisone. Julian was inducted into the National Inventors Hall of Fame in 1990 for his "Preparation of Cortisone" for which he received patent No. 2,752,339. Julian also synthesized the female and male hormones, progesterone and testosterone, by extracting sterols from soybean oil. Julian received dozens of patents over the course of his career related to his scientific work. In 1954, Julian left Glidden and that same year founded his own firm, Julian Laboratories, Inc.. He ran the company until selling it in 1961, becoming a millionaire in the process. In 1964, Julian founded Julian Associates and Julian Research Institute, which he managed for the rest of his life. Julian died April 19, 1975, in Waukegan, Illinois. Julian's many honors include election to the National Academy of Sciences in 1973 and 19 honorary doctorates. He was the first recipient of DePauw's McNaughton Medal for Public Service. In 1993 the U.S. Postal Service issued the Julian stamp in the Black Heritage Commemorative Stamp series. In 1999, the city of Greencastle renamed First Street to Percy Julian Drive. "In 1935, in Minshall Laboratory, DePauw alumnus Percy L. Julian (1899-1975) first synthesized the drug physostigmine, previously only available from its natural source, the Calabar bean. His pioneering research led to the process that made physostigmine readily available for the treatment of glaucoma. It was the first of Julian’s lifetime of achievements in the chemical synthesis of commercially important natural products." “The Life of Percy Lavon Julian 20.” DePauw University. 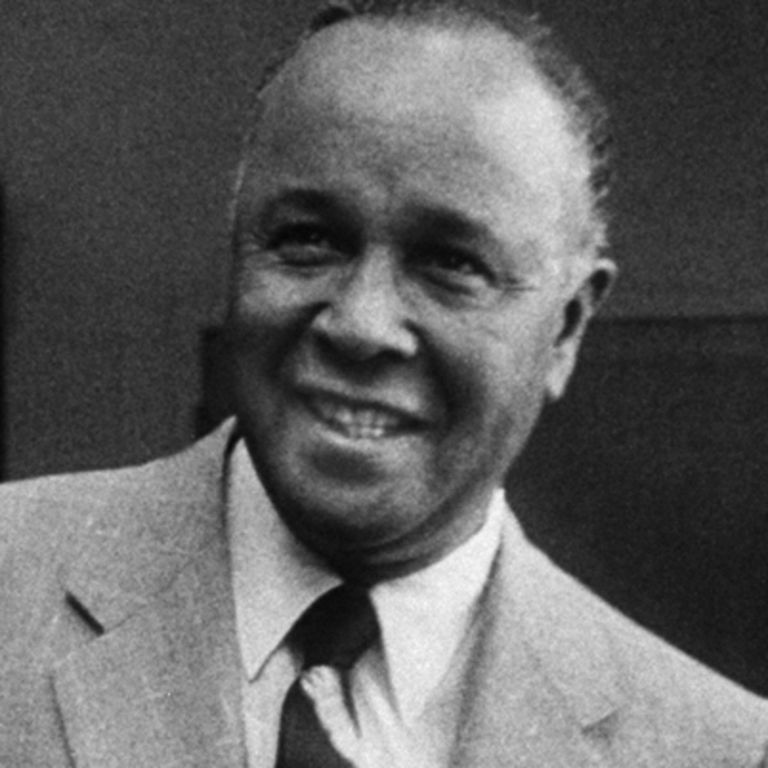 “Percy Lavon Julian.” American Chemical Society. ACSpressroom. “Research of Percy Julian, First Synthesis of Glaucoma Drug, Named National Historic Chemical Landmark."